The academy's success shows that a path exists to address the need for continuous professional data development in government at low cost. On a Wednesday morning, 40 San Francisco city employees file into a room and find their seats. Over the next three hours, Joy Bonaguro, Chief Data Officer of the City and County of San Francisco, will walk them through the basics of information design. Matthew Drazba, an analyst from the Treasurer and Tax Collection department, is here because he wants to learn “a different way of communicating analysis.” It’s not that Matthew is poorly trained; four years at Harvard for his undergraduate degree and five and a half years in the Marine Corps taught him plenty about analysis, research, and writing. Yet in his new job he has found it difficult to translate tax codes and tax database relations in a manner others can easily understand. He heard about the information design class from a coworker and hopes it will help. “Basics of Information Design” is part of Data Academy, a collection of tool- and skill-focused workshops designed for San Francisco employees. 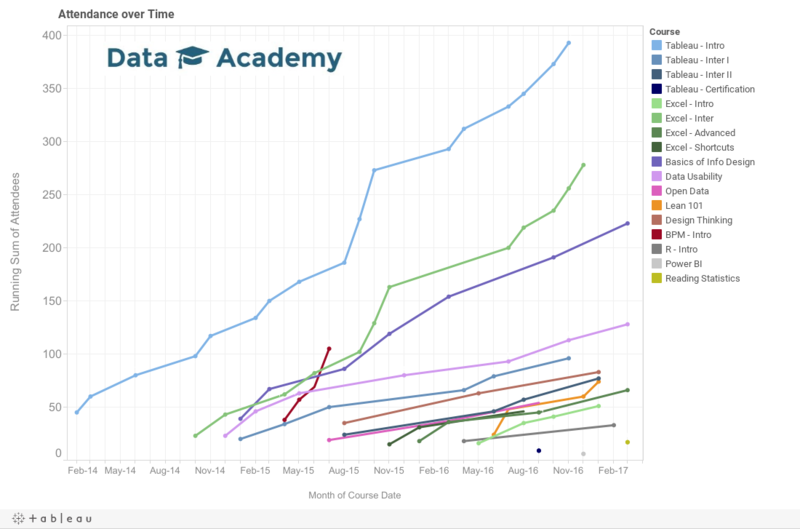 Started in early 2014 through a partnership between DataSF (San Francisco’s data office) and the Controller’s Office, Data Academy has grown from two courses to over thirteen. The number of students has also grown from 80 trained in FY2014, to 400 in FY2015, and over 600 in FY2016. Such rapid growth is in direct response to the needs of Drazba and other city employees like him. While San Francisco has some of the smartest analysts and project managers anywhere, they are often years removed from the classroom. Many want exposure to and training with new practices and tools for thinking, managing, and communicating with data. The success of Data Academy in San Francisco shows that a path exists to address the need for continuous professional data development in government at low cost. Cities need not turn to expensive consultants or outside training; they can instead leverage the strengths and capabilities of their own staff. In 2014, Mayor Ed Lee appointed Joy Bonaguro as San Francisco’s first Chief Data Officer (CDO). As one of her first actions as CDO, she went on a listening tour to meet with city department heads. One topic repeatedly surfaced: the need for training, particularly targeted trainings around the use of data. Training opportunities did already exist in the city. A long-standing partnership with City College of San Francisco allowed city employees to take classes in ArcGIS, a mapping software. However, the classes often took six to eight weeks to complete, making them difficult to fit into employees’ schedules. Inspired by the success of Department of Public Work’s Stat Program, the Controller’s Office offered a more promising opportunity in the form of free, two to three hour Tableau data visualization micro-workshops, developed to introduce city employees to the power of visualizing data for insights. In San Francisco, the Controller’s Office has a division called the City Performance Unit to which every department dedicates a portion of their annual budgets. In exchange, each department can request projects that make use of the City Performance Unit’s army of analysts. Through this sustained work with departments, the Controller’s Office observed two connected trends. First, departments needed more project assistance than the Controller’s Office had capacity or budget to meet. Second, the departments had staff with the potential to handle more advanced analytic projects; what they lacked was the time and space to learn new skills. The Tableau trainings were an initial attempt to address these needs. Bonaguro saw the potential for a larger-scale implementation of this model. She met with Peg Stevenson, Director of the City Performance Unit, and they developed the idea of Data Academy as an official collaborative project of the Mayor’s Office via DataSF and of the Controller’s Office via the City Performance Unit. Leverage in-house teachers: Analysts from the Controller’s Office and staff from DataSF would do most of the teaching. Keep it lean: Classes would be short two- to three-hour workshops, after which workers could return to their desks and immediately apply what they learned. Test the waters: Data Academy would start with a few classes and scale up according to demand. In identifying the initial courses to teach, they took both reactive and proactive approaches. In her role as CDO, Bonaguro instituted an annual survey of analysts in the city. In the inaugural survey, analysts were asked to identify the tools in which they wanted more training. Excel and Tableau were clear favorites. DataSF and the Controller’s Office also proactively identified areas that city employees should be trained in to most effectively engage in data-driven decision making. This led to the creation of courses in data usability, information design, and business process mapping. The Controller’s Office and DataSF staff developed the content and served as teachers for the courses. The first course, Intermediate Excel, was held in October 2014. Any concerns about demand were quickly alleviated by the wave of city employees trying to get into the classes. In fact, the size of the waitlist quickly became an issue. It was a problem of capacity: the Controller’s Office and DataSF had limited staff time each month to dedicate to teaching and administering classes. In subsequent years, the project was renewed with a larger allocation of funds to allow for more Controller staff time to be dedicated to the project: 250 hours in 2014, 700 hours in 2015, and over 1300 hours in 2016. Compounding the administrative difficulties was a facilities issue: the largest computer-equipped training room could only hold 20 people, strictly limiting the capacity for each class taught. Those that did get into the courses advocated for more advanced trainings. This led to the project’s 2016 fiscal year plan to focus on expanding the range of courses offered to include advanced-level courses in Excel and Tableau, introductions to R and PowerBI, a tutorial on the Open Data Portal, and thinking like a designer. Additional Controller’s Office staff were trained to teach classes. Data Academy’s capacity has also been augmented by the generosity and ingenuity of knowledgeable department staff who have volunteered to teach classes, including staff from the Department of Public Health, Public Works, Health and Human Services, the Mayor’s Office of Housing, and the SF Art Commission. In addition, Sherman Luk, the Controller’s Office Program Manager responsible for overseeing the start-up and growth phases of Data Academy, introduced a “train the trainer” model to teach key personnel in departments with high demand for specific courses to become course teachers themselves. These new teachers then created mini-Data Academies within their own departments, helping relieve some pressure on the general classes. Capacity: Despite best efforts, the waitlist for certain courses can extend into the hundreds. Drazba had to wait almost a year to secure a seat in “Introduction to Information Design.” In response, the city is procuring laptops, expanding the per-session capacity to 40 employees. Curriculum: DataSF and the Controller’s Office are focusing on creating a clearer structure to the courses. The goal is to have a defined path for an employee to become a full graduate of the Data Academy. Evaluation: Data Academy has always fielded a course evaluation form immediately following each class, which is used to shape course materials and evaluate instructor performance. In addition, the Controller’s Office plans to implement an annual survey of attendees to track how they have used what they learned in Data Academy to improve city services. The rewards of Data Academy are manifest. Evaluations have been superlative, praising the content, the brevity, and the instructors of the courses. Students feel that Data Academy removes the intimidation factor of new programs and gives them enduring reference materials for application of course material. More importantly, students experience ‘aha’ moments when they are exposed to a new way of thinking about data. This is at the heart of what Data Academy hopes to achieve. During his information design class, Drazba had just such an ‘aha’ moment. He learned to think about “PowerPoint slides as more than a venue to display tables and text,” as he described it, but also a means of thinking graphically and telling a story. Within weeks of finishing the class, he applied what he learned in a presentation to another department, turning what until that point had been a text- and table-heavy PowerPoint into a graphical representation of the process. During the meeting, another city employee said, “Oh my God, I get it. I wish we had this presented to us a year ago.” His supervisors were equally impressed. Classes have led to office-wide change as well. Peg Stevenson points to the work of the Ethics Commission, whose staff members were early attendees of the Tableau course. Quickly embracing the power of visualization, they created dashboards to turn PDFs and database-locked data about campaign finance into visuals easily accessible to the public. Data Academy has also fostered interdepartmental collaboration. Staff members have started impromptu working groups in Tableau outside of Data Academy, creating cross-departmental knowledge-sharing spaces. The Controller’s office intentionally nurtures these spaces by managing an email list of past Data Academy attendees and holding monthly events. Jessie Rubin, a Data Academy analyst and trainer, noted that the Controller's Office has seen unexpected benefits in professional development opportunities for their staff because the 16 teachers/analysts from the department are not just teaching, but learning. The demands of teaching have honed their own knowledge of the material, making them better analysts. According to Sam Abbott, another Controller analyst working on Data Academy, a more important benefit has been the fostering of a universal language of data. Moving beyond data literacy to data fluency opens not just new avenues of communication, but new avenues of thought. As capacity constraints are eased and people are more quickly able to cycle through classes, the development of the curriculum will help codify this progression to data fluency. The hunger for training found in San Francisco’s employees is present in any city whose challenges and solutions rely on the successful interrogation and presentation of data. Data Academy is a leading example of how a city can tackle this challenge with internal resources. “Part of the mission of the City Performance Unit is to help city departments make more of their decisions with information and data, and Data Academy has greatly accelerated this process,” said Stevenson. This starts with enabling individual analysts to think about data in new ways and fostering these capacities and broader culture change through collaboration and networking. By training analysts in the tools and concepts they need to effectively employ data in their work, Data Academy empowers a data-driven future for the City and County of San Francisco. Tableau Angles for Public Sector with PDF Data Tool, Other Updates Community College Removes Barriers to Online Learning What Can Local Governments Learn from UPS?